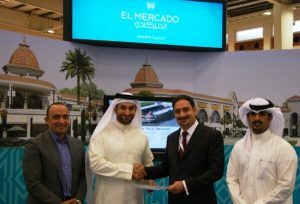 El Mercado Janabiya developers, First Bahrain Real Estate Development Co., have signed on as the Gold Sponsors of the Gulf Property Show 2017. Gulf Property Show, the boutique showcase for the real estate and property development sectors based in the Northern Gulf, is held under the patronage of HRH Prince Khalifa Bin Salman Al Khalifa. The Gulf Property Show will take place from the 9 – 11 May 2017 at the Bahrain International Exhibition and Convention Centre. In a ceremony held last night under the patronage of the Minister of Commerce, Industry and Tourism, H.E. 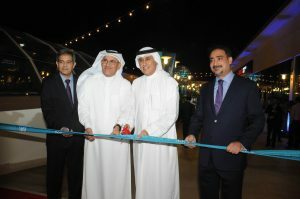 Mr. Zayed R. Alzayani along with Governor Mr. Ali Al-Asfoor of the Northern Governate, First Bahrain officially announced the opening of their neighbourhood market, El Mercado Janabiya. 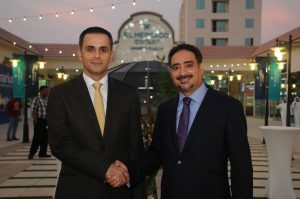 Manama, Bahrain – 16 May 2016: MBA Fakhro Holding has signed the lease for its first Anytime Fitness gym, to be opened in Bahrain at El Mercado Janabiya, the new and exciting neighbourhood market on Avenue 27 just north of the Saudi Highway. Anytime Fitness is the largest fitness chain in the world with a global network that can be accessed by all of its members, 24 hours a day. This world leading brand will be housed in the relaxed atmosphere of El Mercado’s central courtyard overlooking it’s beautiful landscaping. MANAMA, BAHRAIN – 15 March 2016: First Bahrain today announced their participation in Gulf Property Show, 2016. 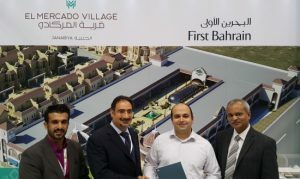 First Bahrain will be showcasing their neighbourhood retail centre El Mercado Janabiya. First Bahrain will also be launching an exciting new development at the show. MANAMA, BAHRAIN – 09 February 2016: MASGO Ventures and First Bahrain today jointly announced the introduction of a new brand to Bahrain with the first branch of NKD Pizza soon to open at El Mercado – Janabiya. McDonald’s Bahrain today announced the signing of their lease to open their latest drive-thru location within El Mercado Janabiya, the impressive new neighbourhood market created by First Bahrain Real Estate Development Co. The new McDonald’s branch will be their 20th branch in the Kingdom. It will also be the only drive-thru restaurant on the ground floor of the open-air retail centre which will also feature a mix of restaurants, cafes and shops on a beautifully landscaped elevated platform, offering scenic southern views in a vehicle-free pedestrian environment. 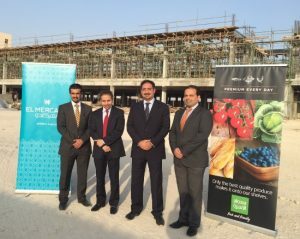 Alosra Supermarket and First Bahrain Real Estate Development Co. today announced the signing of the first lease for the impressive new neighbourhood market – El Mercado- Janabiya a project by First Bahrain. The new Alosra will be the anchor for the open-air retail centre which will also feature a mix of restaurants, cafes and shops on a beautifully landscaped elevated platform, offering scenic southern views in a vehicle-free pedestrian environment. The retail centre, at the corners of Avenues 27 and 79 and visible from the highway, offers quick and easy access to both neighbourhood residents returning from Manama and morning commuters headed to Saudi Arabia. Further supported by 160 covered car parks, it is expected to open to the public in Spring 2016. 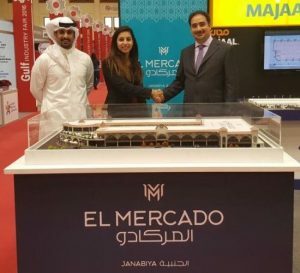 With construction on their neighbourhood retail centre in Janabiya progressing smoothly to the 30% mark, First Bahrain Real Estate Development Co. today unveiled the branding for its new development which will henceforth be known as “El Mercado Janabiya.” The new identity, designed by local consultancy MM Brand, translates to “the market,” honouring the Spanish Mediterranean feel of the architecture while describing the centre as a place which will facilitate both community and commerce in a beautifully landscaped outdoor space. Construction is underway on a neighbourhood retail centre in Janabiya, following a groundbreaking ceremony at the site of the new development where images of the new facility were publicly unveiled for the first time today. This event follows the recent announcement of the funding provided by Kuwait Finance House for this, the first phase of a USD 30 million development which has been designed by Sanad Engineering and being built by the Almoayyed Contracting Group. 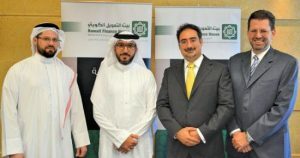 Building on the strength of a long established relationship, Kuwait Finance House – Bahrain (KFH) and First Bahrain Real Estate Development Co. today jointly announced a new project finance agreement which will fund the construction of the first phase of a new USD30 million commercial development in Janabiya. This announcement follows the recent news of the appointment of the Almoayyed Construction Group and Sanad Engineering as the lead members of the project team to design and construct the facility. The new project will be ready for occupancy by the second quarter of 2016.